Shutting yourself off from the view of the world may seem strange to the spiritually undeveloped. But it’s not so different from what we’re all doing in our tech-based, motorized world. The car, the phone, the TV and their many high-tech cousins have made us very much like cloistered ascetics who forswear life in society. We meet each other less and less as the car has replaced the trolley and the wide-screen TV has begun to replace the movie theater. An Internet connection may be our only social link to the outside world. Being a blogger, I guess I shouldn’t talk. Consider telecommuters. They may be a good thing since they don’t waste space and they don’t waste gas. 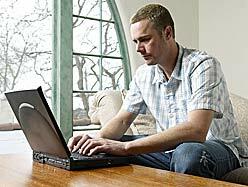 Look a little closer and you realize telecommuting depends on two modern trends: The large house and the small family. It’s hard to imagine how you could concentrate on a work project if you don’t have a room of your own and are constantly interrupted by the noisy demands of children. We’ve got all these home PCs and I supposed they should be put to constructive use. But heading off to work is one of the few remaining activities that gets us out of the house. What happens when even that goes away? Will we devolve into some other creature as our social skills atrophy? Will we develop over-sized butts and long fingers and learn to reproduce without any sexual contact? At least the nuns don’t have to be concerned about that. My advice is we need to get out more. Sunny San Diego is an absurd place to develop Vitamin D deficiency. This entry was posted on April 13, 2010 at 3:06 pm and is filed under Uncategorized. You can subscribe via RSS 2.0 feed to this post's comments. You can comment below, or link to this permanent URL from your own site. Regardless of whether one is isolated in a cloistered convent or abbey, whether one loses one’s self in the bright lights of the secular city,– or behind a PC screen, nowhere on this earth can you escape from human nature in all its frailty– at least, not this side of the grave. Back in the last century, 1995, I believe, I spent five months at a Benedictine Abbey on a city called Oceanside, CA. I was not a real member of the cloistered behooded monks of the Abbey. I worked on the groundskeeper. In exchange, I had a terrific single bedroom with a NIRVANIC view of the Pacific, three meals a day, and all of the religious ceremonies I could ever want to partake in. AS an outsider, infiltrating the covert operations of the monks, I was free to leave the abbey grounds, when not working, praying or otherwise keeping up my part of the agreement. Many of the monks, who were confined to quarters and could NOT BREAK OUT, were not so subtly jealous of my freedom of movement. In a way, I had the best of all worlds. I could sequester myself away from the madness of the outside world. Then when the madness of that inner world got to me, I could travel to that Babylon-on-the-Pacific, called San Diego. It was a schizophrenic existence–perhaps BI-POLAR is a more accurate term. How did I wind up living at a Benedictine Abbey? Why did I leave? I couldn’t get into the “HABIT”. Besides, I was flatin Latin music. Also, the monks maintain a vow of silence after the PM evening prayer, until breakfast the next morning. I talk in my sleep; and I sleep at night. I think someone rattted me out. Oh a bit of monastery trivia. —Why do monks wear robes? Why are monks considered at the lead of the “GREEN” movement”? All of their music is ORGAN-IC. What do you suppose they called the Ccompulsive junk-food eating member of the monastery? What’s the first thing that a doctor always when a monk goes in for a physical? Tom, i agree that we need to get our more. However you mother and I don’t have that problem since, although I had joined the present day as a Mac user, I still memorize phone numbers, use the internet occasionally, and read the New York Times on hard cover instead of going on line. I sure it’s a generational thing.